In this online resource, the Center for Media and Democracy (CMD, the publisher of the award-winning ALECexposed.org investigation) documents the more than $83 million that right-wing billionaires and corporations are spending each year to fuel Tracie Sharp’s State Policy Network (SPN) and its 64 state affiliates, a web of right-wing “think tanks” in every state across the country. Twelve new reports -- a nationally-focused report written by CMD and eleven state-focused reports written by Progress Now member groups and CMD -- released November 13, 2013 expose SPN and select state members. Although SPN's member organizations claim to be nonpartisan and independent, an in-depth investigation reveals that SPN and its member think tanks are major drivers of the right-wing, American Legislative Exchange Council (ALEC)-backed corporate agenda in state houses nationwide, with deep ties to the Koch brothers and the national right-wing network of funders. The reports reveal some members abusing tax laws and masquerading as "think tanks" while really orchestrating extensive lobbying and political operations to peddle their legislative agenda to state legislators, all while reporting little or no lobbying activities. CMD's investigation uncloaks some of the major funders of these expanding operations in the states and raises major concerns over whose agenda these front groups are advancing in the states. Go to StinkTanks.org (a project of Progress Now and CMD) and see below and the linked SourceWatch resources for more. 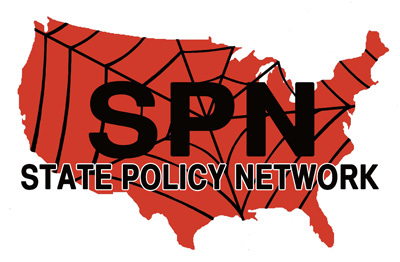 In response to CMD's national report -- titled "EXPOSED: The State Policy Network -- The Powerful Right-Wing Network Helping to Hijack State Politics and Government" -- SPN Executive Director Tracie Sharp told national and statehouse reporters that SPN affiliates are "fiercely independent." Later the same week, however, The New Yorker's Jane Mayer caught Sharp in a contradiction. In her article, "Is IKEA the New Model for the Conservative Movement?," the Pulitzer-nominated reporter revealed that, in a recent meeting behind closed doors with the heads of SPN affiliates around the country, Sharp "compared the organization’s model to that of the giant global chain IKEA." She reportedly said that SPN "would provide 'the raw materials,' along with the 'services' needed to assemble the products. Rather than acting like passive customers who buy finished products, she wanted each state group to show the enterprise and creativity needed to assemble the parts in their home states. 'Pick what you need,' she said, 'and customize it for what works best for you.'" Not only that, but Sharp "also acknowledged privately to the members that the organization's often anonymous donors frequently shape the agenda. 'The grants are driven by donor intent,' she told the gathered think-tank heads. She added that, often, 'the donors have a very specific idea of what they want to happen.'" Rachel Maddow on the State Policy Network, "A Stealth Campaign"
Although SPN's affiliates -- like SPN -- are registered as educational nonprofits, several appear to orchestrate extensive lobbying and political operations to peddle their legislative agenda to state legislators, despite the IRS's regulations on nonprofit political and lobbying activities. See, for example, the "Featured Stink Tank" below. While it has become an $83 million dollar right-wing empire, SPN and most of its affiliates do not post their major donors on their websites. The identities of the donors we have discovered reveal that SPN is largely funded by global corporations -- such as Reynolds American, Altria, Microsoft, AT&T, Verizon, GlaxoSmithKline, Kraft Foods, Express Scripts, Comcast, Time Warner, and the Koch- and Tea Party-connected DCI Group lobbying and PR firm -- that stand to benefit from SPN’s destructive agenda, as well as out-of-state special interests like the billionaire Koch brothers, the Waltons, the Bradley Foundation, the Roe Foundation of SPN's founder, and the Coors family -- who are underwriting an extreme legislative agenda that undermines the traditional rights of modern Americans. Corporations like Facebook and the for-profit online education company K12 Inc., as well as the e-cigarette company NJOY, also fund SPN, as demonstrated by its most recent annual meeting. All of SPN's 64 member state think tanks have pushed parts of the ALEC agenda in their respective states, and at least 34 of them have additional direct ties to ALEC (beyond SPN's own ties as an ALEC funder). SPN think tanks have introduced, echoed, pushed, and reinforced ALEC policies to hamstring labor, privatize education, disenfranchise minorities, students, and the elderly, and rollback environmental initiatives in the states. Please see the SourceWatch article on SPN Ties to ALEC for more. For more, please see PRWatch here. According to the National Review and SPN's website, SPN was founded at the suggestion of President Ronald Reagan. 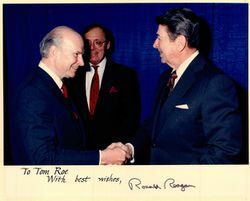 In a conversation with Thomas Roe (a member of his "kitchen cabinet") in the 1980s, Reagan allegedly suggested Roe create "something like a Heritage Foundation in each of the states." SPN was formally created as an "umbrella organization" to provide "advisory services" for the web of state-based Heritage-like groups -- bankrolled by Roe and other conservative funders -- in 1992. From 1992 to 1998, SPN operated in a relatively limited organizational capacity. Then, according to SPN, "SPN's Board of Directors realized the need for a stronger organization that would provide additional services. 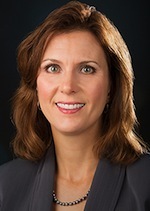 After extensive discussions, the existing Board took a bold and historic step in September 1998, dissolving itself and appointing a transitional Board to fulfill the broader role envisioned for the organization." SPN has continued to grow at a rapid rate, expanding from 43 member state think tanks in 2002 to 64 member state think tanks in 2013. Please see the SourceWatch article on SPN Founders, History, and Staff for more. Center for Media and Democracy, A Reporters’ Guide to the "State Policy Network": the Right-Wing Think Tanks Spinning Disinformation and Pushing the ALEC Agenda in the States, PRWatch, April 4, 2013. PRWatch, How SPN "Think Tanks" Will Spin ALEC's 2016 Agenda, September 30, 2015. Washington Post, In N.C., conservative donor Art Pope sits at heart of government he helped transform, July 19, 2014. Center for Media and Democracy, A Reporters' Guide to Rex Sinquefield and the Show-Me Institute: What Reporters, Citizens, and Policymakers Need to Know, organizational report, April 29, 2014. Providence Journal, R.I. Center for Freedom and Prosperity Shapes Public Policy Anonymously, February 23, 2014. Mother Jones, Meet the New Kochs: The DeVos Clan's Plan to Defund the Left, January/February 2014 issue. Media Matters, New Hampshire Newspapers Create Faux Legitimacy For ALEC-Connected Group, January 6, 2014. Lincoln Journal Star, Report criticizes conservative Nebraska think tank, January 2, 2014. Truthout, As It Turns Out, There Still Is a Vast Right Wing Conspiracy - The Many Friends of ALEC, December 12, 2013. Media Matters, A Media Guide To The Right-Wing Agenda Of North Carolina's Civitas Institute, December 12, 2013. PRWatch, A Reporters' Guide to the "State Policy Network" -- the Right-Wing Think Tanks Spinning Disinformation and Pushing the ALEC Agenda in the States, April 4, 2013. ↑ Progress Michigan, Mackinac Center Admits to Lobbying Lawmakers, organizational press release, January 29, 2013. This page was last edited on 21 May 2015, at 17:19.